UFC 3 is available worldwide on February 2, 2018 for Xbox One and PlayStation 4. 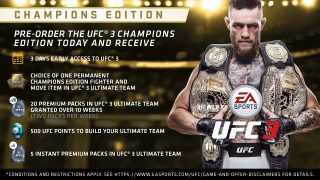 Unlock the full game early on January 30 by pre-ordering the UFC 3 Champions Edition! 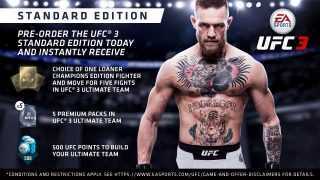 Receive 2 Premium Packs upon logging into UFC 3 Ultimate Team. Remaining packs will be delivered by Friday each following week.